The report highlights major initiatives during the year and details our strategic business and financial performance. During the 2013/14 year, State Trustees finalised the two-year business transformation program with 60 projects delivered, welcomed a new CEO and new Chair, developed a new Corporate Plan for 2014/15, prepared for the head office relocation to Footscray and made significant progress to becoming a world leading trustee organisation. 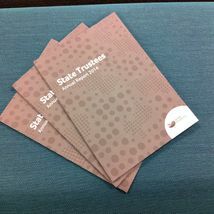 The report also highlights State Trustees’ work in the community through the State Trustees Australia Foundation, CONNECTED Art Exhibition, sponsorship of the Victorian Seniors Festival and advocacy and education for vulnerable Victorians.